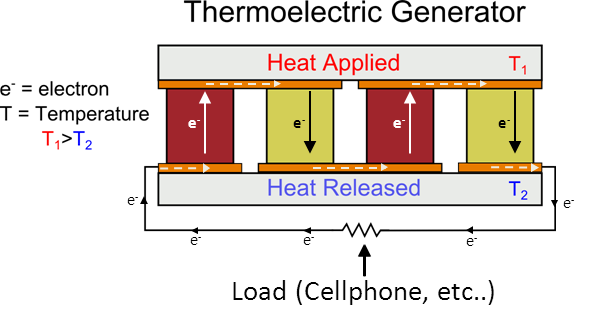 A thermoelectric generator (TEG) generates electricity when there is a thermo-gradient between two dissimilar conductors. In layman’s terms, when two metals (conductors) are placed together (thermocouple) and cold is applied to one side and hot to the other (temperature gradient), electricity is produced. This is a form of the thermoelectric effect known as Seebeck effect (named so after Thomas Johann Seebeck who identified this phenomenon in 1821). Much like the diffusion of hot air into cold air (2nd law of thermodynamics), the temperature gradient in two dissimilar conductors creates the flow of heat – a flow of charge carriers or electrons – creating a voltage difference i.e. electricity! Modern thermoelectric generators still only have around 5% – 8% efficiency, but as expected, research is constantly making this number increase. Modern thermoelectric generators are now being created using highly doped semiconductors, making them much less bulky then the earlier versions created using bimetallic junctions. A thermoelectric generator converts heat directly into electricity. As heat moves from a gas burner through a thermoelectric module, it causes an electrical current to flow. 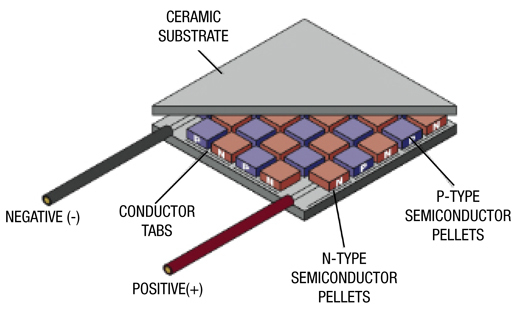 At the heart of every GPT TEG is a hermetically sealed thermoelectric module, called a thermopile. This contains an array of semiconductor elements. The durable module provides a chemically stable environment for the thermoelectric material and ensures a long service life. A burner maintains a high temperature on the hot side while cooling fins keep the other side cool. The temperature difference across the thermopile creates steady DC electricity with no moving parts. GPT’s individual generators range in output size from 15 to 550 Watts, and are ideal for applications requiring power up to 5,000 Watts. Another tinkerer, Ann Makosinski invented a flashlight that runs on the heat of a human hand using the thermoelectric effect of peltier tiles. Automotive Thermoelectric Generators (ATEGs) are designed to capture the huge waste of engine heat, reclaiming it as electricity which results in a reduced load on the electric generator which is powered by loading down the engine. Using the ATEG will thus reduce fuel consumption.